Uglyworld #1960 - Looks, A Giants Roboter! - (Project Cinko Time - Image 166-365), a photo by www.bazpics.com on Flickr. Todays over in Los Angeles alls of my gooders buddies and friendlies will be having a massivers party at Uglycon which takes place at Giants Roboter on Saturdays! As there was no chances of me and Baz makerings it to Los Angeles we hads to makes the mosts of our very own Saturdays instead, and checkers out what I finders near Yangpu Bridger in Shanghai, looks, a giants roboter!!! 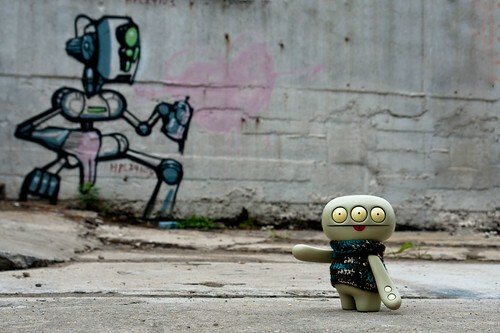 Shanghai Uglycon has officiallies kickered off, wooohooo!